Dachsies' long hair can get wet in the weather. As a general rule, smaller dogs have greater life expectancy than huge hounds. Little dachshunds can be expected to live between 12 and 15 years with good care and a bit of luck. 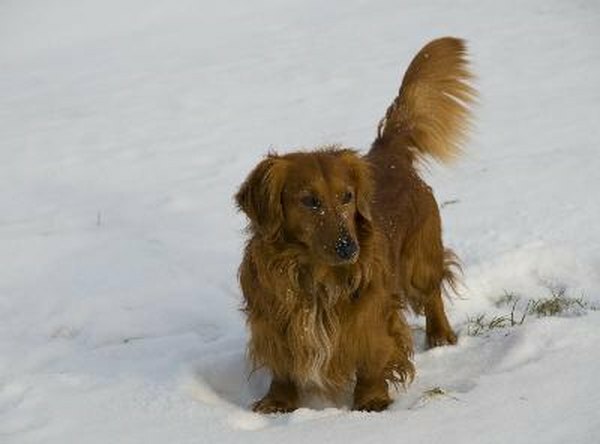 Dachsies come in short, long or wiry-haired varieties. A happy and healthy dachshund can live to 15 years or even older -- some wiener dogs live to be 17 or older. The chances of your hound living a long life are increased if you feed him appropriate quantities of high-quality food and enable him to undertake regular exercise. Exercising your dachshund twice a day allows him to build a strong and healthy body, and to keep off excess weight. If a dachshund becomes overweight -- commonly through overfeeding or inactivity -- this places a strain on the dog's long back. A dachshund's life expectancy is greatly affected by the state of his back and skeleton. Many dachshunds have to be put to sleep if their back becomes injured and they can no longer walk or function. Probable life expectancy is also shortened if you don't keep your dog's vaccinations current, as this exposes him to illness and infection. Long-haired dachshunds need more regular and careful grooming than their short-haired counterparts. 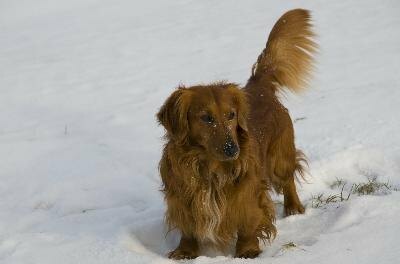 The silky, long fur of this kind of dachsie can easily become matted and tangled without regular grooming, and a messy coat can be painful and uncomfortable for the dog. If dirt and the dog's own poo or pee become caught in the tangled fur, this can cause a real health threat and may potentially shorten the dog's expected lifespan. Long-haired dachshunds come in standard and miniature sizes. A miniature dachshund typically weighs less than 11 pounds, while a standard-size sausage dog weighs in between 15 and 28 pounds. A third size, the kaninchen or "rabbit" size, is recognized in Europe, weighing between 8 and 10 pounds. There is no difference in the life expectancy of these three sizes of dachshund; the length of your dog's life will depend on its breeding, overall health and life events.